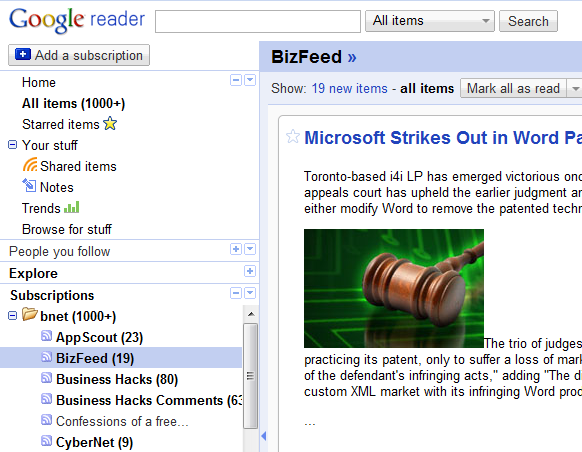 Can you spot Google Reader's sidebar show/hide tool? No? It's hiding in plain sight. Reader Jenny sent me this impassioned plea: "I use Google Reader to keep up on my favorite blogs and sites. I clicked something and now the subscriptions list that was on the left side of the screen has disappeared! How do I get it back? Help!" Have no fear, Jenny: I, too, use Google Reader, and I know exactly what happened. That subscriptions list you mention is part of Reader's sidebar, which is collapsible, meaning it can scoot out of the way to provide more room for reading (hardly necessary in these days of widescreen monitors). The problem is, the control that collapses Reader's sidebar sits right next to the subscription-list scroll bar, so it's very easy to click by accident. In fact, you might not even notice it's there, as it's virtually invisible until you mouse over it. If you do click it, the sidebar vanishes, leaving behind a Navigation menu button that, when clicked, temporarily displays your subscriptions. But what if you want the sidebar back permanently? Simple: Move your mouse arrow to the left edge of the screen until it hits a narrow vertical line, at which point the arrow turns into a hand. Click that line and presto: The sidebar reappears. Google really needs to come up with a better system for showing/hiding the sidebar. In the meantime, at least now you know how to find it the next time it goes missing. That's it for me this week. Hope everyone has a safe and happy holiday weekend! See you back here on Monday.